One thing that Judaism has is lots and lots of mitzvos. Mitzvos that govern how to eat, talk, get dressed, get married. Most of the mitzvos are related to specific acts (like cooking) or specific times (like waking up in the morning). There are, however, six mitzvos that one is supposed to keep in mind all the time. They are known as the six constant mitzvos. I was reading an article on Aish.com, and it reminded me that I hadn’t thought about these mitzvos in a while (yes, the irony is not lost on me). One of the neat things about these six mitzvos, is that all the other mitzvos help feed into them. They are all kind of a way to develop a continual state of being aware of G-d. 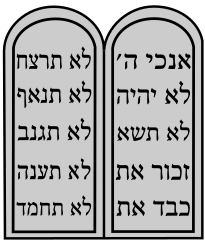 The six constant mitzvos are supposed to be what I’m thinking about all the time (yeah, I’m not there yet), and all the other mitzvos I do, like making a bracha before and after I eat something, for instance, are supposed to help me remember these basic six mitzvos. I love it when things are all interconnected like that. Know that there is a G-d.
Yep. Rule number one. Think the first of the ten commandments. This is it, more or less. It’s important to note the phrasing of this mitzvah, specifically that it says to “know” that there is a G-d, not to “believe” that there is a G-d. This is kind of tied in to last week’s Torah Tuesdays, about choosing to see the miracles in our life. When taking a closer look at the mind-boggling structure and order within nature, it can solidify one’s understanding that there is a Creator who arranged all of that. One perk of this mitzvah is that it’s one of the easier ones to do as a mommy. Just take a moment during the day and say, “Hey, I know there’s a G-d.” It’s not the kind of mitzvah which can be interrupted by a baby, or that interferes with dinner prep. The trickiest part is remembering to do it. I heard of a lady once who took time to review the six constant mitzvos everytime she was at a stoplight. That’s it for this week. Short and sweet. Take some time each day and try to do this mitzvah. Thanks for the reminder. Very good post. Thanks for really good post. I just wanted to add one thing-I heard this from R’ Yerachmiel Milstein (maybe it’s just another twist to it because there are many ways to explain each concept in Judiasm). The six constant mitzvos are mitzvos that can be done at any time of the day, and you get rewarded for it every time you do/think about those mitzvos. I never heard that it’s a must – you must think about these things all day – (how would that be possible anyway?) but more like, every time you think about it you get a mitzvah. So to use the first of the six constant mitzvos as an example, every time you strengthen your knowledge in the fact that there is a G-d, by thinking about the many miracles He does for us or by thinking about the amazing-ness of the world around us (the beauty of creation, a healthy person, the depth of science…all created by G-d), you are getting more and more schar – and who wouldn’t want to collect mitzvos?! I sure would!! Thanks again for this great post! Oh, I really like that angle. You’re right – who wouldn’t want more schar! I was also wondering how it was possible to think about them “all the time.” My understanding was that it was more like a thinking about them enough times until it was really internalized kind of thing. Like Shivisi Hashem L’Negdi Tamid. Thanks for the great comment! You’re welcome :-) Glad to be able to share some insight on this.